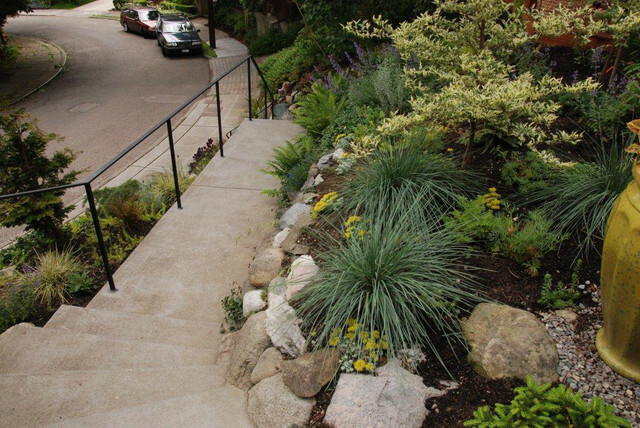 Land2c Landscape Architecture 12 Reviews Tight Site But Big Entertaining 6 Saves | 0 Questions Land2c The new metal handrail flanks the steep slope and entry stairs. 3 dwarf Stewartia 'Frosted Emerald' trees give height and help hold the steep, original rockery--a major goal. Plants are a mix of drought tolerant grasses, shrubs, succulents, conifers, lavenders, and ferns. Inviting all year long.